Dining & Entertainment in Massachusetts and Rhode Island: Dinner For Two® Dining Book offers over $1500 in FREE dining and entertainment. Buy 1 get 1 FREE dinners, luncheons, dinner theatres, dinner cruises and more. Dinner For Two® Dining Book features the finest restaurants and venues in Southeastern Massachusetts and Rhode Island including Cape Cod, the SouthCoast region, as well as the Newport and Providence area. Dining Coupon Book in the Southeastern Massachusetts and Rhode Island. Dinner For Two Dining® Book is good through December 30, 2019. Also available at choice retail locations. 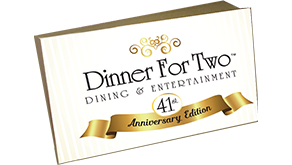 The 2019 Edition Dinner For Two Dining® Book features over $1500 in FREE dining and entertainment. Buy 1 get 1 FREE dinners, luncheons, dinner theaters, dinner cruises and more. It's easy! Just bring your Dinner For Two Book® with you when you dine at any of the participating establishments, and start saving! Buy 3 Get 1 Free! The Perfect Gift! Buy 3 Get 1 Free! The Perfect Gift! including Cape Cod, the SouthCoast region, as well as the Newport and Providence area. *Offers limited to participating locations. Visit these retail locations to purchase your Dinner For Two® Book today! Big Value - 718 Dartmouth St. Your Privacy: Dinner For Two® Book, Inc. is committed to providing quality service. One of the newest and fastest growing delivery channels is the Internet. A concern arising from the rapidly changing world of technology and specifically the Internet, is your right to maintain privacy. We assure you that we share your concerns and are committed to ensure that all information you supply us is held in strictest confidence. Visitors to Dinner For Two® Book website will remain anonymous. We do not collect personal identifying information about visitors to our site. If you provide identification (such as name and address) via email or online form, or ask for information, the information provided will only be used to communicate with you to handle your request. It is not sold or transferred to other parties. Our servers only collect standard non-identifying information about visitors to the site, such as date and time visited, IP address, city, state and country. This information is used to compile standard statistics on site usage. If you wish to place a secure online order please click here. © Dinner For Two®. All Rights Reserved. Website by JS Web Solutions.